Google silently introduced its Family Link service in 27 new European countries. Up until now, Family Link was initially available in the United States only, but starting this week, most people living in the EU countries will be able to enjoy the benefits of Google's service. Here is the list of countries where Google Family Link has been introduced recently: Austria, Belgium, Bulgaria, Croatia, Cyprus, Czech Republic, Denmark, Estonia, Finland, France, Germany, Greece, Hungary, Ireland, Italy, Latvia, Lithuania, Luxembourg, Malta, Netherlands, Poland, Portugal, Romania, Slovakia, Slovenia, Spain, and Sweden. Aside from the countries added today, Google Family Link went live in other regions in the previous months, such as Argentina, Australia, Brazil, Canada, Chile, Japan, Mexico, New Zealand, and the UK. 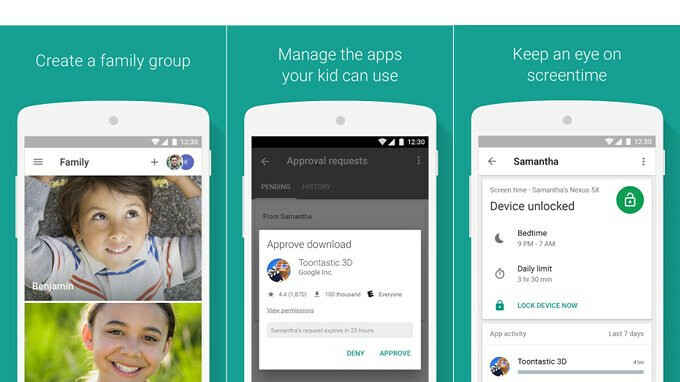 With the help of the Family Link app available via Google Play Store, parents can create Google Accounts for their children. Through these accounts, parents can manage the apps their children can use, keep an eye on the screen time to see how much time they spend on the phone, as well as set device bedtime. Although some functions of the phone like music players and messaging apps that run in the background aren't fully tracked with weekly or monthly activity reports, Google Family Link remains a great tool for parents who want to set certain digital ground rules for their children. I use this for my kids and I love it. Shut em down at 9pm. I be like, "get your asses ready for bed"